1. What is Virtual Box? Virtual Box is a desktop virtualisation product for Windows, Mac (Intel), Linux and Unix operating systems. You can download Virtual Box from http://www.virtualbox.org. If there is an update, you will be notified when you next run VirtualBox. VirtualBox has been taken over from Sun by Oracle Inc. The Binaries and source are released under the GPL 2 license. 2. What guest operating systems are supported? Virtual Box supports a wide range of operating systems including: DOS such as Freedos, Windows (3.1 to 10) (see evaluations), Windows Server, Linux, Solaris, BSD such as FreeBSD or NetBSD, OS/2 such as Arc Noae, Mac OS from Apple (only if the host is a Mac) , Netware 3, and others. 3. What host operating systems are supported? 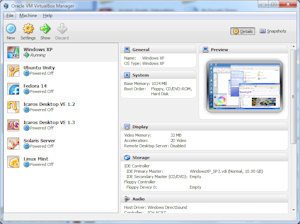 Virtual Box can be installed on Windows, Mac OS X, Linux and Solaris systems. You can download them from the Downloads page. Older versions of VirtualBox can be found here. 4. Can I use VM disks from Virtual PC and VMWare? Yes, you can import virtual hard disks created from Microsoft's Virtual PC and VMWare's Workstation products and use .VHD and .VMDK files. Virtual Box also uses it own .VDI hard disk format. You can import full virtual machines which were exported in the open OVF format. If you want to convert VHD files to VDI, you can use the VBoxManage CloneHD command to convert the files. 5. How do I create a new Virtual Machine? Use the New button to start the Create a New Virtual Machine Wizard. Step by step instructions are available on this New VM page. 6. How do I install the Virtual Box Additions tools? Once the VM Guest is set up and the operating system is installed, login to your machine, click on the Devices menu and select Install Guest Additions. This will mount the additions iso onto your guest machine. It may auto start, if not, open the CD icon and click on the program to begin installation. The additions iso file can be found in C:\Program files\Oracle\Virtual Box\VBoxGuestAdditions.iso on Windows systems. It contains additions for 32 bit and 64 bit Windows and a package file for Linux/Unix systems. If you have a Linux guest machine such and no user interface then mount the ISO from Devices , CDROM menu, then in the shell type mount /dev/cdrom /mnt/cdrom to mount the ISO in Linux, then type sudo /mnt/cdrom/VBoxLinuxAdditions-x86.run (there is an x64 version) to install the tools. Run umount /mnt/cdrom to remove the disc. 7. What keys can I use with VirtualBox? 8. What hardware does Virtual Box use for Guests? Other Controllers = SATA, SCSI, SAS, Floppy, USB and NVMe. 9. How do I share files between the Host and Guest systems? You can mount CD or DVDs via the Devices menu. You can use Floppy Drives. You can also use Shared Folders with the Host system. The shared folder will appear in Network, Entire Network, Virtual Box Shared Folders. You can map a drive letter to it using 'Map Network Drive' or the Net use command. 10. How do I save the state or take snapshots of it? On VirtualBox windows, click on the Snapshots tab and select 'Take Snapshot' (Ctrl+Sihft+S) or select it under the Machine menu (Host+S). 11. Can I use Remote Desktop Connection tool to connect to VBox machines remotely? Yes, in the machine's settings, click on Display and then select the Remote Display tab. Tick the box for 'Enable Server' and click OK.
12. Can I run Windows on VirtualBox? a) Windows 95, Windows 98 (SE) and Windows Me. sharing to copy files from your host to your system or use ISO files to mount on the Optical drive on the guest system. * In the guest settings, you need to disable the advanced Processor and Acceleration options for PAE/NX, VT-x/AMD-V and Nested Paging otherwise the OS will crash. * You will need to add a Floppy Controller so that you can boot from a 98 Boot disk with CDROM drivers installed to install the OS. * To enable ACPI BIOS install using the SETUP /P J command. * You should use the SciTech Display Drivers v7 for Windows 9x systems. See Properties, Display driver to enable the new driver. * Change the default Sound Card from AC97 to Soundblaster 16 in the Audio section of VBox Settings. * Use the AMD PCNET network drivers for access to the network. * For the hard disk use a fixed sized hard disk of upto 2 GB (dynamic sized disks can produce disks too small for use with FDISK). * You need to run FDISK to create a primary DOS Partition and then run FORMAT C: to prepare the hard disk before running SETUP. * Install Rain (Rain20.zip) to update CPU to idle properly using HLT command. * You may need to update the DirectX components to v8.0a. Instructions on installing Windows 95 can be found on HowToGeek. the hard drive ready for installation. For a fast install, copy the I386 installation folder to C: drive, and run WINNT.EXE /X /B /S:C:\I386 for floppyless installation. * For Windows NT 4.00 use the Microsoft Windows NT 4 starter configuation, a 4GB Hard drive, 512 MB or more memory. * Change the default Sound Card from AC97 to Soundblaster 16 in the Audio section of VBox Settings. Use the Multimedia Control Panel to select the audio device. * In the guest settings, you should disable any USB adapters as Windows NT cannot use USB. Enable the serial ports instead. * For Networking use the AMD PCNET Network Adapter. * For the Display Driver, you need to use the VirtualBox Display Driver from the VirtualBox Guest Additions. * Shared Folders are not supported for Windows NT, so use Bridged or Host-Only Adapters and use standard windows sharing to share files between host and guest. * For backup software you can run Veritas Backup Exec or AceBackup. Instructions on installing Windows NT 3.51 can be found on Wiki How. Instructions on installing Windows NT 4.0 can be found on Wiki How. c) Windows 2000, 2003, XP and 7 or Server editions. These are fully supported on VirtualBox and can be installed via a phyiscal disc or ISO file onto a VM. For Windows 8.x, you need version 4.2.0 or later, of VirtualBox which supports full Windows 8 , as that shows Windows 8 as a option in the Guest list for a new Virtual Machine. You should allocate at least 1024 MB of memory and 27 MB of graphics memory and it will need VT-x/AMD-V and Nested Paging acceleration enabled. If you have problems with mouse response then remove the VBox Mouse driver and use the default Windows driver. You can install the latest version of Windows 10. Depending on your version of Virtual Box, you can select Windows 10 or Windows 8.1 as a basis of your virtual machine. Evaluation disc images are available from MS Dev Center or use the Media Creation tool. 13. Can I install other OS versions on to VirtualBox? It is possible to install Netware 3.12 on Virtual Box in a Other, DOS setup. Later versions of Netware seem to crash on VirtualBox. VMWare or QEmu products are best for Netware. There are some instructions on installing DOS and Netware 3.12 on VirtualBox at Fox Dog Studios. The latest AMD PCNTNW LAN drivers can be found on Novell dev website. DOS/Windows clients can be found on the FreeDos site. To install MS-DOS, please visit the Guide to DOS on Virtual Box for full details on configurating DOS on VirtualBox. Windows 3.1 can be install on Freedos in standard mode only. Windows 3.1 and Windows for Workgroups 3.11 can be install on MS-DOS. This is more complicated as Apple Macs are different to PCs in suble ways. i) You will need access to a Mac to download the mac OS image from Apple's Mac Store. The VM will only run on Mac hardware (it fails to boot on other makes). ii) You then need to create a bootable ISO image using this script from Insanely Mac site. This uses the hdiutil command to create the required image. iii) You will then need to create a virtual machine in Virtual Box and modify the VM using the VBoxManage using this script. iv) For Snow Leopard (10.6.5), please use these instructions instead to install it on VirtualBox. v) There are no Guest Additions to install, it works without them. You can share files by 'Connect to server' using smb://host-ip-address. Most Linux or Unix websites provide an ISO image for the OS, this makes it very easy to install it on a standard VM within VirutalBox. Guest additions and tools are available with VirtualBox for Linux and Solaris guests. 14. Can I transfer a Virtual Machine from Hyper-V to VirtualBox? boot up fine. Once the VM has booted up and you have logged in you can install the VirtualBox Guest Tools. 15. The virtual hard disk is full. Can I extend the disk size? Yes, you can use the VBoxManage.exe tool to extend the size of the hard disk. b) Change directory to the folder where your hard disk file is stored. The default is c:\Users\username\VirtualBox\Machines\VM_Name. d) Type "C:\Program files\Oracle\VirtualBox\VBoxManage.exe" modifyhd filename.vdi --resize number_of_MB (where the size is in Megabytes so 25600 is approx 25 GB). e) To extend the system disk, you will need to boot from a Gparted disc image to resize the volume after resizing the disk. 16. Can I close the VM Window and leave the machine running in the background? Yes, you can close the main VBox window. Note, that Virtual Box is not a real replacement for Enterprise production systems. You would be advised to use VMWare vSphere or Microsoft's Hyper-V virtualisation systems. 17. My 64 bit virtual machine will not load any more and crashes at startup? I find it best to delete the old configuration, but not the hard disk files. Create a new VM machine with same settings and attach the old hard disk files to it. It should then start up. Also, check that the Hardware Virtualisation option is enabled in the BIOS settings when booting the PC. 18. How do I create floppy disk images for Virtual Box?